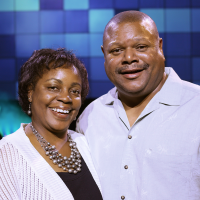 Pastors Al Thomas and Lisa have been attending Rock Church since July of 2009. They are dedicated leaders that have overseen several ministries including our Guest Lounge, Ushers, Greeters and Men’s Ministries. They are both graduates of the ISOM School of Ministry. He’s also traveled outside of the United States ministering the gospel of Jesus Christ. Pastors Al and Lisa currently oversee our Altar Care, New Believers and Grow Deeper Ministries. These ministries encourage and disciple those that have made a decision to give their lives to Jesus Christ. It's Pastors Al and Lisa's passion to help all believers gain a deeper understanding of what God has said about many different topics. Pastors Al and Lisa have been married since July of 1984 and have been blessed with two amazing children, Al Jr. & Dominique, and one equally amazing grandchild, Caleb. Pastors Al and Lisa have been called to be helpmates to Pastors Eddie & Dawna, helping teach encourage and offer spiritual guidance to all who are in need.